seven − six = Required Please enter the correct value. 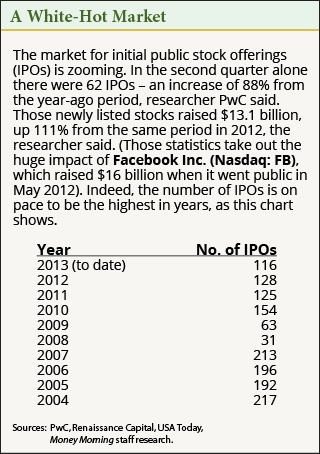 As we move deeper into the second half of the year, we're seeing a robust IPO market that has been able to shake off 2012's Facebook IPO shame. So far this year there have been 116 debut offerings, the strongest pace since 2007. As Money Morning Executive Editor Bill Patalon explained earlier this week in his Private Briefing investment service column, the IPO market in 2013 is "white hot." From Bill's analysis: The market has locked and loaded on about $4 billion in U.S. IPOs so far this year, Bloomberg News reports. At that pace, companies "going public" would raise the most this year since at least 1999, the financial news service says. The best part of 2013's IPO market strength: the aftermarket performance has been strong with many deals more than doubling after the initial offering. That's why the IPO calendar is still crowded, giving investors plenty of options for more profit plays from these fast-growing companies. A notable deal this week coming to the U.S. markets from overseas is Franks International. Franks is a 75-year-old oil and gas equipment company based in the Netherlands. The company supplies engineered tubular products that are used to provide a conduit for oil and gas to reach the surface in the drilling process. New techniques like horizontal drilling and deeper offshore drilling have increased the need for highly complex and technical tubular products throughout the industry. The company notes in the prospectus that its highly engineered products currently have 104 U.S. patents and 136 related international patents. It also has 37 U.S. patent applications pending and 111 related international patent applications pending. The company is seeing strong numbers, with revenue growth of 45% and EBITDA growth of 79% on the year ended Dec. 31, 2012. About 45% of revenue was derived from outside the United States, and almost 70% came from the offshore and deep-water drilling markets – the industry's fastest-growing segment. Franks' market share in deep-water tubular products is 29% making them a dominant force in the industry. Franks International will be pricing 30 million shares between $19 and $21 on Friday, Aug. 10. Barclays, Credit Suisse and Simmons & Company are joint mangers of the $600 million deal. Once the offering is complete the shares will trade with the symbol FI.